Using Hand Held Tools - Just what is allowed? We just completed our first seminar and tagalong for the year and fortunately the weather has cooled down a bit. A bit of gold was found by the people who came to the course but the most interesting thing was being confronted by a few locals around Udo's Lease who clearly don’t know the rules. In fact I have noticed that there is and increase in some being shown by some people prospecting in the bush. Not all of them are the leaseholders either but people illegally detecting upon the leases in the first place. Look at this photo which is clearly illegal and threatens damage – this was not even put up by the leaseholder but the story goes it was someone else who didn’t want people to go metal detecting in that area. This same thing happened last season at Stakewell where a couple were evicted from land where they had permission to metal detect by someone who said they represented the leaseholder. When they contacted the leaseholder it turned out that that was not the case and the person was an imposter. So, what are the things you can do to overcome this sort of nonsense out there. Firstly know where you are allowed to go metal detecting. 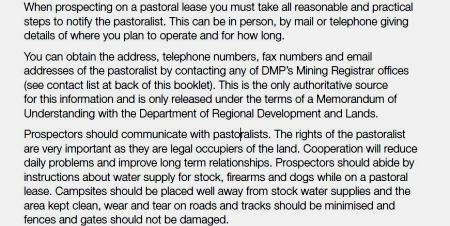 If you don’t know already read our webpage Metal Detecting Laws and this pamphlet put out by the Dept of Mines and Petroleum. Knowing your rights and the rules is your most powerful protection. Get written permission off Leaseholders of granted Leases! You CAN access pending leases which are simply applications for a lease to be granted. These are leases coloured with blue diagonal lines in Tengraph. You do NOT need permission from the person who applied for these leases to access them. We teach the use of Geomap at our seminars and seminar/tagalongs. Geomap is freely provided by the Dept of Mines and Petroleum and when you link this to the downloadable tenement shapefiles and connect your PC to ,a GPS Aerial you can use moving maps real time, and know EXACTLY where you are on the ground. 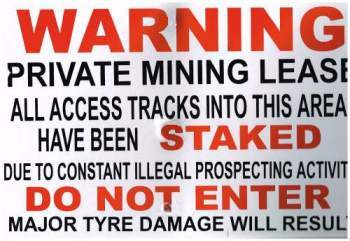 This way you will not stray onto areas where you are not permitted such as granted mining leases. Jeff and Jo at Reeds Prospecting also run some courses in Perth. APLA periodically arrange training in Geomap also depending on Demand. Scroll down to the bottom of the page for the free Geomap software download with the instructions. We will be building a website on geomap training in the near future so you it will be easier to learn all about it at your own pace with videos and checksheets that will help you every step of the way. If you don’t know how to use Tengraph Online download this ebook We have just upgraded it to reflect the recent changes to Section 40E. We strongly support good communication and discussion with Pastoralists whose land you will be visiting. You never know what is happening in the area where you are going and the local Pastoralist will be able to advise you if they are doing anything in the area that will be a problem. Using Hand Held or Hydraulically Driven Machinery. We were curious to see if the use of hand held equipment had changed in any way and just what constitutes a hydraulically driven hand tools so we wrote to the Dept Mines and Petroleum about it, here is there reply. “I refer to your email query of 15 February 2013 regarding prospecting using hand held equipment. “4O. (1) A permit holder is not to use powered or hydraulically driven hand tools on the land the subject of the permit”. A permit referred to here is one issued after application is made under Section 40E of the act to enable prospecting on a granted Exploration Licence. Under Regulation 4O the equipment referred to in your email such as a “Shaw portable Backpack drill or cordless 36 volt rotary hammer drills or a 4 stroke hand held jack hammer” cannot be used under a Section 40E Permit. Gold Price and Where is Gold Heading? We subscribe to a free newsletter called "Money and Markets" and one of their analysts had this to say about where the gold price is headed. B. Gold rallies and closes above $1,760 on a Friday-closing basis. Those are the latest signals on my models. In between $1,384 and $1,760 gold is in a neutral trading range. And as long as gold remains under $1,655.80, the bias will be to the downside and a test of $1,384 remains a high probability. So you see, gold can bounce up to the $1,656 level and it still remains bearish short-term. Moreover, it would have to rally a full $160 to enter a new bull leg to the upside. Now, I can hear even more questions: "If gold were to rally and close above $1,760 you will turn bullish, yet you will have missed a huge move!" My reply: Then so be it. I don't really care. What matters is buying when it's safe to buy. And given that gold long-term is heading to more than $5,000 an ounce, I'm not concerned if I miss a $160 move to make sure I'm buying a confirmed bull market and not some giant bear market rally. Where do you think the price of gold will go? Seminars and tagalong tours to the end of July have been booked out but there is vacancies for the training after that. This is a link to the page relating to Gold prospecting lessons and seminars. This page has been updated to reflect the 2013 vacancies. You are probably packed and ready to go out and get the gold, we wish you luck and many big nuggets in 2013. Know your rights, know where you are on the ground and stand your ground out there. If anyone is abusive or violent then get some details like licence number, their description, type of vehicle, Photo if possible, GPS point on location and report them to the local police - you dont have to put up with that. The same with the threatening signs, photograph them and get the GPS points and lease number and send them to the Dept Mines and Petroleum.